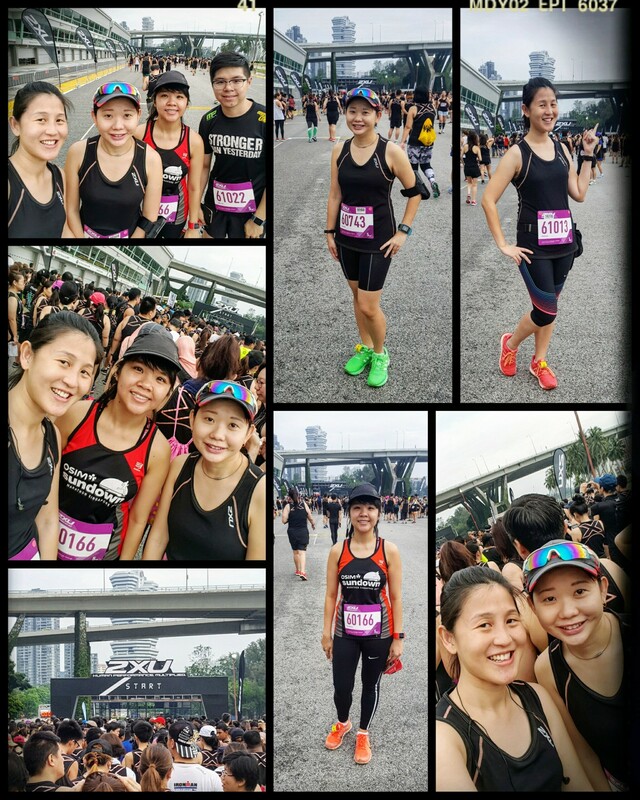 Race Review: 2XU Compression Run 2017 [5KM] (by Rebekah Ong) | JustRunLah! 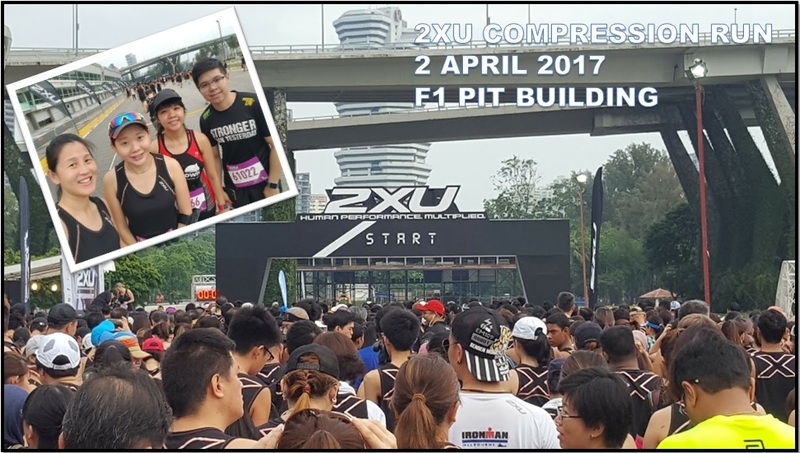 “Let Your Heart Set the Pace” is this year 2XU Compression Run tagline and I did just that! 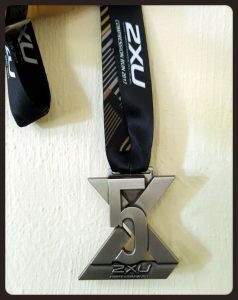 I was determined to get a good timing and achieved my personal best at this year 2XU Compression Run! 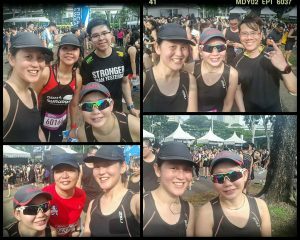 This is one of my favourite runs and I have been joining it almost every year (2013,2014 & 2016) and this is my 4th one to date. 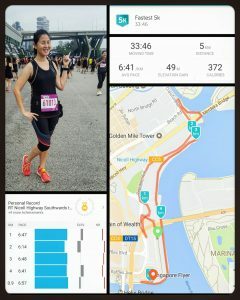 I participated in the 5km category this year. 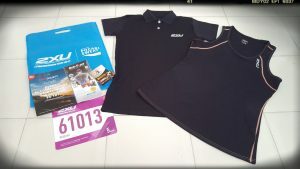 Nice Event Tee – Over the years, 2XU had some of the nicest event tees. 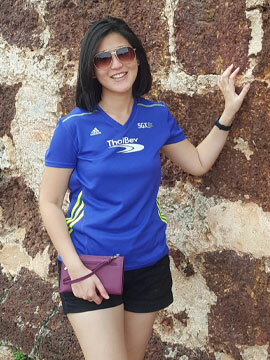 I love the flattering cut of their tees and the colour combination is just sooo pretty! For 2017, the combination was black & rose gold trimmings! I love rose gold or anything pink so it’s two thumbs up on the event tee. Reasonable pricing – Because I have previously participated in past year events, I was entitled to loyalty rates for 2017. For that price of $45, 2017 loyal participants received both an event tee and a special polo tee. 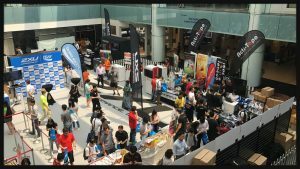 Well organised – Every year, 2XU Compression run events are really well organised but this year, they did have a few minor hiccups which I will touch on later. Competitive 5km – Not many runs have a competitive 5km category. Though I’m not competing for any podium wins, I still like to have a timing chip to record my timing and see how I’m progressing. Also, 5kms are fast and you get to finish a workout and enjoy the rest of the race festivities. 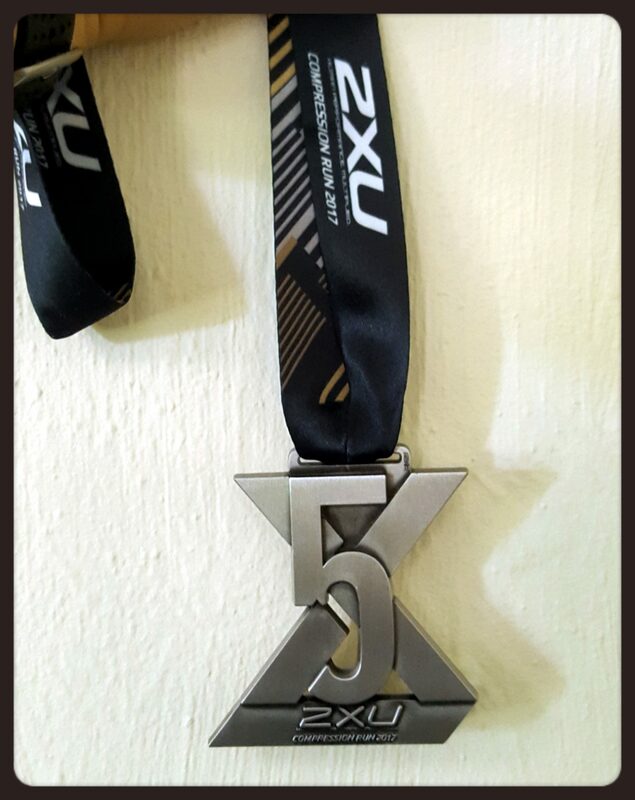 Well-Crafted Medal – The 2XU Compression Run medals are always cool and sleek and 2017 5km medal lifts up to it’s standard of being beautiful designed! 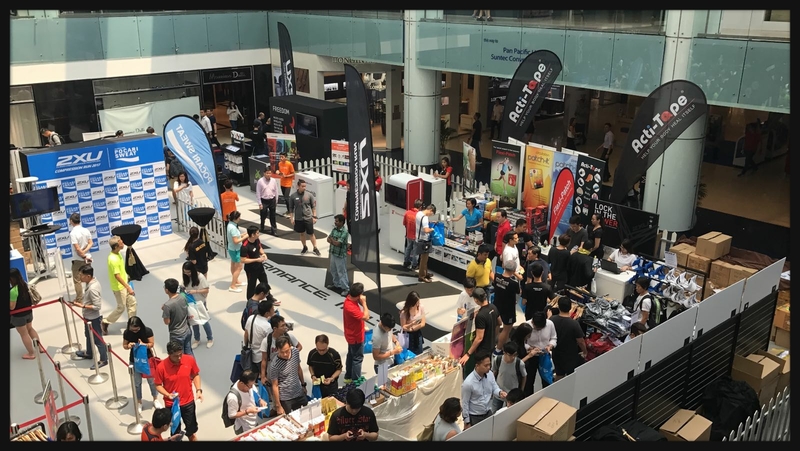 This year REPC was held at Marina Square over the weekend of 24 to 26 March 2017. My friend, Pearleen, collected the race entry kit on my behalf. Thank you Pearleen! Pictures of the REPC were by snapped by her too. Her feedback on the REPC was that it was well-organised though the queues were long. From what I gathered it was definitely MUCH better than the Sundown Marathon REPC! There was NO 2.5hrs wait and queues did move fast. She collected the race packs on the first day of the REPC and queue times did not exceed more than 1/2 an hour. Fast and efficient were definitely the words to describe the REPC according to her! Everything went smoothly and there was no chaos at all. There were lots of good deals at the REPC according to Pearleen and some of my colleagues who went to the REPC during the first day of collection. There was a sale for previous race tees and they were being sold like hot cakes! Other merchandise like running gears and accessories had really good discounts! For participants that could not make the first REPC, the organiser had a 2nd REPC at Velocity on a smaller scale but that allow flexibility on collection. My friends and I arrived at the race site around 07:30hrs since our flag-off was at 08:00hrs. The race site was easily accessible as the area was not fenced-up, unlike Sundown Marathon. Cheng Yee and I headed straight for the bag deposit area. Normally, I would not bring a bag to a race but there were forecasts of rain and I thought I better bring a change of clothes just in case I got drenched if it did pour. Bag deposit was fast and efficient and we headed to meet our other friends before heading into the START pen. With 10 mins to spare, we made our way leisurely into the START pen. The atmosphere was relaxed and we were able to find a spot near the front as it was not crowded at all. We did some light stretches for warm-up before we were promptly flagged off at 08:00hrs. It was a bit of a challenge weaving through the walkers and joggers at the beginning but I picked up my pace and managed to clear it after a while. I wanted to do well for today’s short run and I was determined! Short but challenging were the words to describe this 5km route! The first slopes appeared slightly into the 1st km at an underground tunnel near Republic Boulevard. The next slope that the 5km participants had to scale was the tunnel at Crawford Street. Other than those 2 slopes, it was pretty much flat all the way. 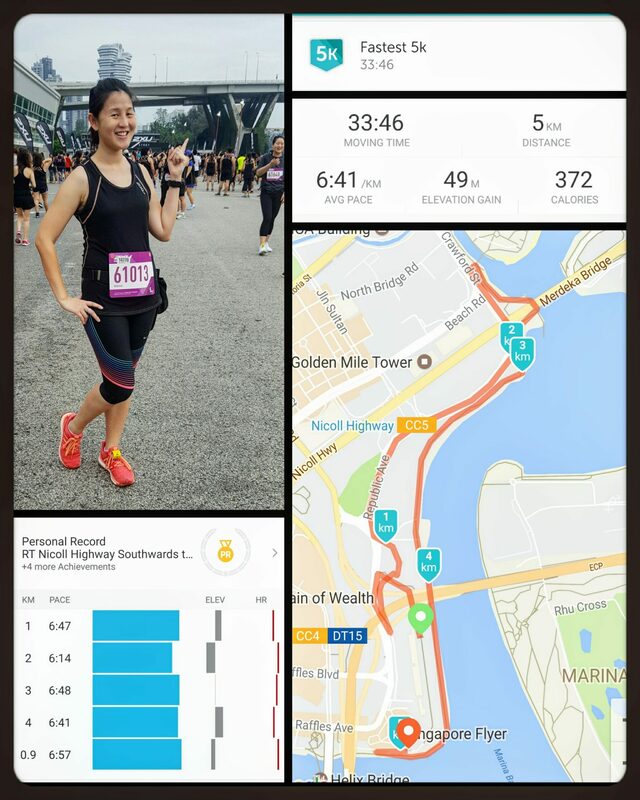 This was not a scenic route except for the long stretch at the Kallang Basin where you would see iconic buildings such as the Singapore Sports Hub and Gardens By The Bay on the opposite site. When I saw those building I knew the finish was fast approaching. Distances markers were clearly position but did not reflect the actual distance accurately. When I ran past the 3 km distance marker, my Garmin reflected that there was a 500m discrepancy. I was not the only one that noticed this, in fact, my other friends noticed that too. 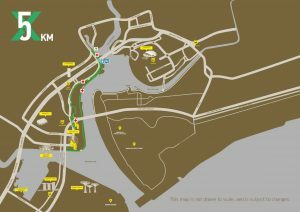 I thought that actual route would be lesser than 5km but thankfully the organisers had planned out the route accurately. There was only one hydration point at along the 5km route and that was situated at the Crawford Street tunnel. It was well spaced out and participants were able to get their drinks and quickly carry on with their run. I finished the race with an unofficial timing of 33mins and 45secs! This was a personal best for me! Super happy with the timing and I couldn’t wait to share the good news with my friends! The good news had to wait a little longer as tAfter crossing the FINISH line, all the participants were led to the collect their medals and refreshments. Though there were signages, they were not placed high enough and you could only see it when you got closer. This led to confusion because participants were queuing in the wrong section. There were no clear lines and it was chaotic. My friends queued in the wrong category line and only noticed when they got closer. One of them even got handed a wrong medal and only noticed after she had cleared the collection area. For me, I had to go to another section as the 5km area had run out of bottled Pocari drinks. This was the first time I ever experienced such an unorganised post race collection at a 2XU Compression Run event. This was not the end of the chaos, after I collected my medal and refreshments, getting out of that area was also a challenge as participants were trying to avoid a wet and muddy area to avoid their shoes from being soiled. This caused a bit of a jam. After clearing that area, I decided to collect my bag! I was greeted with long snaking queues for bag collection! 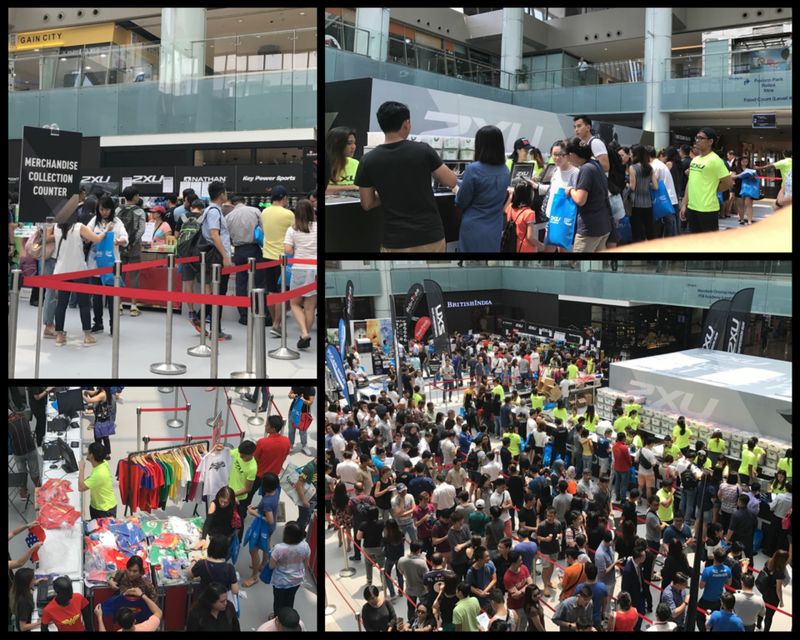 According to my friend Cheng Yee, this was the first time that she encountered long queues for bag collection at a 2XU Compression Run event! It took us about half an hour to collect our belongings! Sadly during that time, my colleagues had finished taking their photos and cooled down enough. They left for breakfast while I was queuing. Also I had other friends that managed to check out the festivities at the carnival area got themselves some freebies. This kind of spoilt my post race experience because I spent majority of my time queuing! If the organisers, had planned the bag collection better, I would be able to go and meet them and also check out the photo opportunities and games around the carnival area. Well, all is not lost, we managed to catch-up with a friend, Kim, whom we have not seen since our gym days at California Fitness. Luckily, the company while queuing made the long queues bearable. An improvement point would be to have volunteers help with crowd control so that there would not be snaking queues and they would be able to facilitate the crowds to the right line thus making bag collection faster and more efficient. 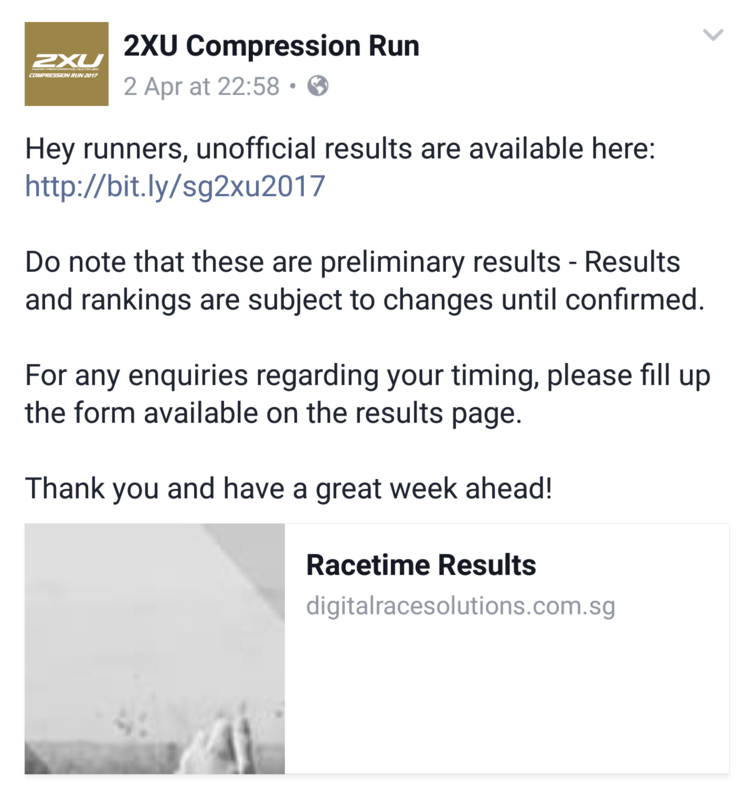 Preliminary results of the race are up on the 2XU Compression Run website less than 24 hours after the race. 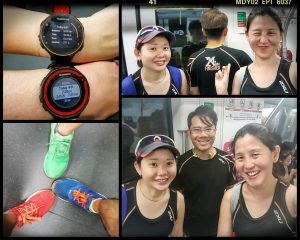 That is fast for an organiser but I guess all of us appreciate it especially when entering a run event. Looking forward to some nice photos! Overall, it was still an enjoyable race despite the queues at the end. 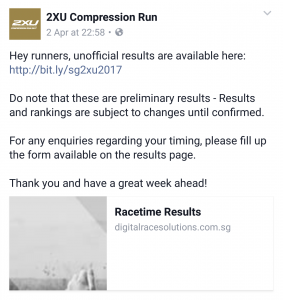 I hope the organiser would look into this feedback and not have these issues in the next edition of the 2XU Compression Run. If you are new and considering to join a run event, 2XU is definitely a good one because it has categories across for everybody! From beginners to the experts! Congrats to all participants on finishing strong and creating your personal best! Till my next write-up, run happy and enjoy that journey! Well organised race but with minor hiccups! Suitable for all level of runners!